This month’s spotlight is on Birthday Wishes, an organization devoted to providing birthday parties to children experiencing homelessness. The responses below are written from the voices of Birthday Wishes staffers Kasey Fitzgerald and Lisa Vasiloff. What is the story behind Birthday Wishes? Birthday Wishes was inspired by an act of kindness, and was founded in the fall of 2002 by three friends (Lisa Vasiloff, Carol Zwanger, and Karen Yahara) who hoped to let their children experience the joy of helping others, and believed that birthday celebrations build self-esteem and provide a sense of normalcy not often experienced by homeless children. They asked a local shelter if their families could throw birthday parties for the shelter’s children on a monthly basis. The first party was November 4, 2002 at the Second Step in Newton and the guest of honor was a five-year-old boy. Since then, the program has grown into a multi-state non-profit serving more than 200 shelters in Massachusetts, Rhode Island, and Long Island, NY. We offer two types of party programs: Our On-site Program provides monthly parties at the shelters we serve and celebrates all children, ages 1-17 years, with birthdays in that month. Our Birthday-in-a-Box Program provides a party box and birthday gifts to children and their families staying in domestic violence safe shelters, hotels, and scattered sites so they are still able to celebrate their special day. Birthday frosting all over the face FTW! Photo courtesy of Birthday Wishes. What are the core community activities of Birthday Wishes? Our core activities are our monthly On-Site and Birthday-in-a-Box parties. The On-Site parties are run by trained community volunteers, and our birthday boxes are built by hundreds of community groups, families, and companies. More than 1,000 gifts are wrapped by volunteers every month at our Newton headquarters. We also hold two fundraising events every year. CakeWalk is a family-friendly, noncompetitive 5K walk that concludes with a festival of activities including field games, face painting, live music, crafts, a family raffle, free refreshments and more. Over 200 walkers - individuals, families, clubs, schools, scout troops, corporate groups and neighborhoods - participate in CakeWalk each year. We also hold a gala called the Birthday Shuffle - our "grown up" event featuring casino games, food, and dancing. Birthday Wishes CakeWalk. Photo courtesy of Birthday Wishes. How has Birthday Wishes made an impact? The mission of Birthday Wishes is to improve and empower the lives of homeless children and their families by providing joy, play, and hope through the magic of a birthday party. Our goal is to ensure that children experiencing the trauma of homelessness have the opportunity to celebrate their birthday joyfully, surrounded by family, friends, and others who care. Our impact extends to the shelters and agencies with few resources, and the community at large, by bringing together those that have with those that need. In FY 2017 celebrated 5,241 birthday children (2,517 birthday girls and 2,724 birthday boys), provided the experience of a Birthday Wishes birthday party to 26,194 homeless children, delivered 3,603 birthday boxes, wrapped 20,964 birthday gifts, threw 1,085 On-Site birthday parties, and supported 207 homeless shelters and agencies in New England and Long Island, NY with family strengthening programs. Since 2002, more than 180,000 homeless children have experienced the joy of a Birthday Wishes party. Hooray for birthday parties! Photo courtesy of Birthday Wishes. What’s an example of how Birthday Wishes has made a difference? Our most compelling example of how Birthday Wishes makes a difference are past program-recipients-turned-volunteers: Stacey and her son Tim. Tim turned 6 years old while living in a domestic violence shelter with his mom. Stacey didn’t have the ability to throw a party for him, but Birthday Wishes was there to ensure his special day was celebrated. Today, Stacey and Tim are living in stable housing and volunteer as Party Coordinators for Birthday Wishes, running birthday parties at the Casa Nueva Vida shelter in Boston every month. Stacey shares, "I was horrified that I wasn’t able to throw a party for Tim, and was moved to tears when Birthday Wishes threw him his party. It was like any birthday party I would have given him. Tim was genuinely happy. Birthday Wishes provides the families a moment of comfort during a very difficult time." What does Birthday Wishes need most right now? Our top 3 needs are: 1) financial support to reach more shelters in New England; 2) new/larger warehouse space as our headquarters operates out of a church, and 3) brand new (in original packaging) gifts. Birthday Wishes is unique in that we only accept brand new, never opened toys, games and hygiene products. Kids are awesome. 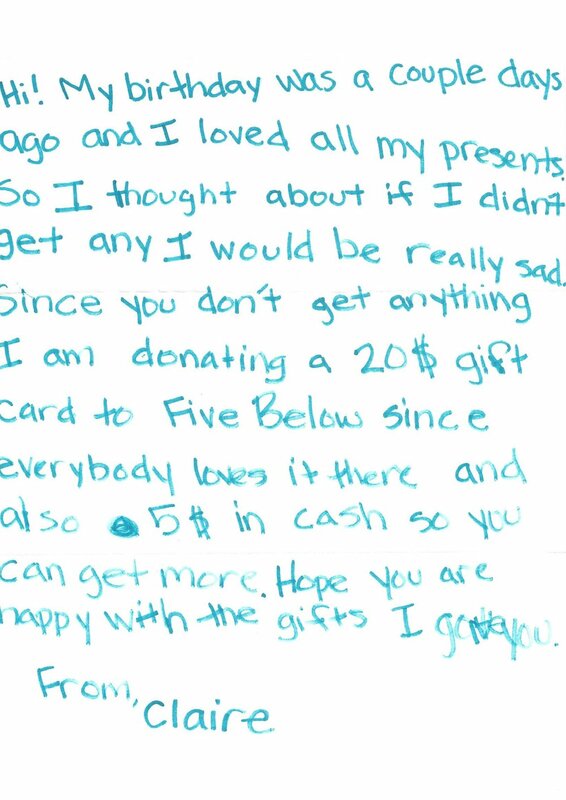 A letter from one of Birthday Wishes' young donors. Photo courtesy of Birthday Wishes. Thank you, Birthday Wishes, for all you are doing for families! If you want to support Birthday Wishes, an easy way would be to share this feature. And another great way would be to drop them a donation!